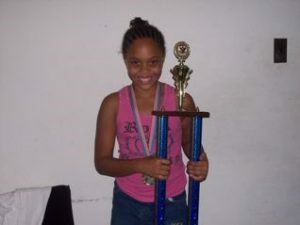 Shakirah and her fifth grade class at Parker Elementary School won first place in the national “First In Math” competition through her involvement with the computer learning center. Shakirah comes to the Kenyon Hodges Computer Learning Center almost every day after school and during the summer. She does her homework and uses the resources available to her at the KHCLC (computers, reference books, project supplies, tutors). On days that Shakirah misses school due to illness or doctors’ appointments, she comes to the center so that someone can call the school and get her assignments so she won’t be so far behind when she re-turns to school. Shakirah says that her favorite parts of the KHCLC are computer access, the summer program, trips and Homework Club. Shakirah thinks the center is “more fun than sitting around Kingsbury with nothing else to do”. Recently the KHCLC began a program in digital arts using on-line classes at the Youth Digital Arts Cyber School. Shakirah is currently taking digital painting and looks forward to learning about composing digital music. Shakirah is a 12 year old young lady entering sixth grade this year. She has lived at Kingsbury’s Twin Towers all her life with her mother and two older brothers. As Shakirah and her friends mature their needs will change. With their input, The Staff is constantly thinking of future programming so that we can continue to meet the needs of the teens and tweens in our community.